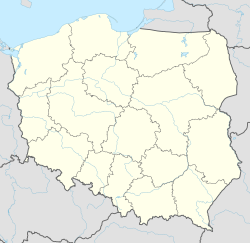 Tomaszów Mazowiecki pronounced [tɔˈmaʂuf mazɔˈvjɛt͡skʲi] is a medium-sized city in central Poland with 63,601 inhabitants (2016). It is situated in the Łódź Voivodeship (since 1999); previously, it was part of Piotrków Trybunalski Voivodeship (1975–1998). Tomaszów occupies an area of 41.3 square kilometres (15.9 sq mi) as of 2002. The town is situated on the banks of three rivers, the Pilica, Wolbórka, and Czarna Bielina, and is near the Sulejow Reservoir and the edge of the Puszcza Spalska wilderness area. Tomaszów Mazowiecki was formed in 1788 in the Crown of the Kingdom of Poland by industrialist Tomasz Ostrowski based on local supply of the iron ore. The settlement fell into the Prussian Partition in 1793 during the Partitions of Poland, and since 1815 in the Russian Partition. The metal industry was expanded around 1820. Tomaszów received city rights in 1830 during the November Uprising against the Russian Empire in Congress Poland. A year later the first Jewish Qahal was founded. By 1931 the Jewish population of the city grew to 11,310 inhabitants, or about 30% of the general population of Tomaszów. During the Nazi-Soviet invasion of Poland in 1939, the city was overrun by Nazi Germany. Next month the Great Synagogue was burned to the ground as first on 16 October 1939; the remaining two synagogues were destroyed on 7–14 November. The Ghetto for the imprisonment of 16,500 Polish Jews was created in December 1940, and closed off from the outside in December 1941. Hunger was rampant, followed by the typhus epidemic. In December 1942 some 15,000 Jews were deported aboard Holocaust trains to Treblinka extermination camp. Some 200 Jews from Tomaszów are known to have survived World War II. According to 2006 data, Tomaszów has an area of 41.3 square kilometres (15.9 sq mi); about 45 percent of the land is put to agricultural use, 13% is forested, and the city itself covers about 4.03% of the area. In the valley of the Pilica river in the south-eastern part of the town there is a unique natural karst spring of water containing calcium salts, that is an object of protection in Niebieskie Źródła Nature Reserve in Sulejów Landscape Park. The origin of the name of the reserve Niebieskie Źródła, that means Blue Springs, comes from the fact that red waves are absorbed by water and only blue and green are reflected from the bottom of the spring, giving that atypical colour. The reserve in situated near the end of Saint Anthony Street (in Polish: ulica świętego Antoniego) that begins in the centre of Tomaszów Mazowiecki, in proximity to the central Kościuszko Square. The Sulejow Lake is a large reservoir built from 1969–1973 in order to help meet the demand for fresh drinking water in the city of Łódź and the city of Tomaszów Mazowiecki. The reservoir is situated on the territory of three gminas: Tomaszów, Piotrków and Wolbórz. It is popular place for water sports, including windsurfing, canoeing and sailing. In the city there is first in Poland year-round ice skating rink that serves for speed skating, figure skating, ice hockey, short track and roller skating. It is located near Pilica River. During the occupation of Poland in World War II, several strategic bunkers were built by Nazi Germany near Tomaszów Mazowiecki. The construction of the two large air-raid shelters was started in early 1940. The so-called Konewka Bunkers (now a tourist attraction) were a complex of various concrete structures hidden in the woods, including an enormous 380 metres (1,250 ft) long bunker capable of protecting an entire trainset from the possible air raid. The shelters in Konewka and in Jelen, built of reinforced concrete, served as unloading stations for military cargo. Similar train bunker for Adolf Hitler – known as Anlage Süd – was built in Stępina, 260 km distance southeast of Tomaszów. Since 1929 in the city exist bus public transport. Now, this is 773 routes during weekdays and 375 at the weekend. Since 2018, public transport in the city is free of charge. The largest shopping center on the Wolbórka river - "Galeria Tomaszów"
The Ostrowski Palace, built in 1812. Now, regional museum. The oldest shopping center "DH Tomasz"
One of stadiums of city football club "Lechia 1923"
^ Staff writer; no by-line (2017). Population. Size and Structure and Vital Statistics in Poland by Territorial Division in 2016, as of December 31 (PDF). Warszawa: Główny Urząd Statystyczny. p. 117. ISSN 2451-2087. ^ a b c d Fronczkowski M. (2015). "History of Tomaszów Mazowiecki". "Tomaszowscy Żydzi", Towarzystwo Przyjaciół Tomaszowa Mazowieckiego. Muzeum Historii Żydów Polskich POLIN. Retrieved 19 April 2015. ^ "New USD 13 million speed skating arena opens in Poland". ^ PPHU IMAX (2017). "Bunker in Konewka. Tourist Route - Poland". Lodz. ^ "Офіційний сайт міста Івано-Франківська" (in Ukrainian). mvk.if.ua. Retrieved 7 March 2010. Wikimedia Commons has media related to Tomaszów Mazowiecki. This page was last edited on 30 January 2019, at 09:56 (UTC).